If ever there was a comfort food, Turkish manti is it. These dumplings were first introduce to Anatolia during the Ottoman Empire, as far back as the 13th century when nomadic Mongol horsemen carried with them a dried version. The more classic Turkish recipe dates back to the 15th century when it was recorded as an Ottoman recipe, this is the same version which is still enjoyed by Turks today. Manti, which is also referred to as Turkish ravioli may vary in size and shape depending on the region from which it comes. They may be boiled, steamed, baked or fried, but the recipe itself is fairly standard. A classic pasta dough is rolled out and filled with a mince of either lamb or beef and onions and spices then folded and cooked. It is then served topped with a garlicky yogurt sauce and sprinkled with sumac, red pepper, oregano or mint. The making of manti is nothing short of a family affair. Ladies get together rolling, filling and folding these dumplings, spending hours gossiping about the latest news. Aunts and sisters, mothers and daughters, the making of manti is a group effort. Especially if the dish is being served to celebrate a wedding or engagement. However, it would be just as common to make for the family dinner. While dried manti is sold in little shops and at neighborhood bazaars, there is nothing more comforting than homemade manti, it’s almost certainly the extra infusion of gossip that ishomemade manti’s secret ingredient. Here is my mother in law rolling dough for manti in our village on the Black Sea. 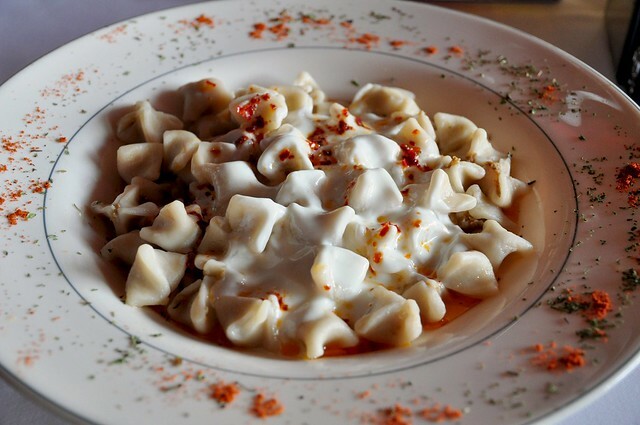 Aside from the classic manti perhaps the most famous Turkish manti is from Kayseri and named accordingly. Kayseri, a city in Central Anatolia is known for it’s tiny tiny manti.This manti is served in the water it is boiled in. The water is typically infused with tangy tomato sauce and can be served as a soup before the entre. Classically each dumpling should not be larger than a peanut. However as legend tells it, in Kayseri if a woman becomes engaged, her future mother in law will pay her household a visit. The bride to be must prepare for her a dish of manti. The brides skillfulness in the kitchen will be judged upon this test. Ask someone from Kayseri what the proper size a manti should be and they will tell you a spoonful must contain 40! I don’t envy the brides in that town. Heading over to the Black Sea is another famous manti. Sinop manti. These dumplings are larger in size and are known for their soft, thin, delicate skins. These are the cashmere of dumplings. I am really fortunate that I get to spend a lot of time in Sinop but if I didn’t I would seriously consider making trips just for the manti served here. They are topped with melted butter (garlic yogurt if you wish) chopped local walnuts and chili oil. Absolutely decadent. Another manti which you must try upon your visit is a relative newcomer to the scene. Bodrum manti from the Aegean region has kicked things up a notch. They small dumplings and fill them with classic minced meat, potatoes, spinach and cheese or even chicken and then lightly fry them and top the dish with yogurt and oregano. It’s pretty awesome. This is not health food, obviously, but what comfort food is? There are many variations on the classic manti when you come to Turkey you must do yourself a favor and try at least one variety. We eat it all four seasons and for any occasion. Manti is a treasured culinary tradition.